The 1907 parsonage is surrounded on two sides by the L-shaped apartment building. Historic Seattle picked MarketFront at Pike Place Market and The Parsonage, an apartment project that incorporates a 1907 parsonage, as winners in its 10th Annual Preservation Awards. The awards recognize public and private projects. The Parsonage is a student housing project at 4138 Brooklyn Ave. N.E. 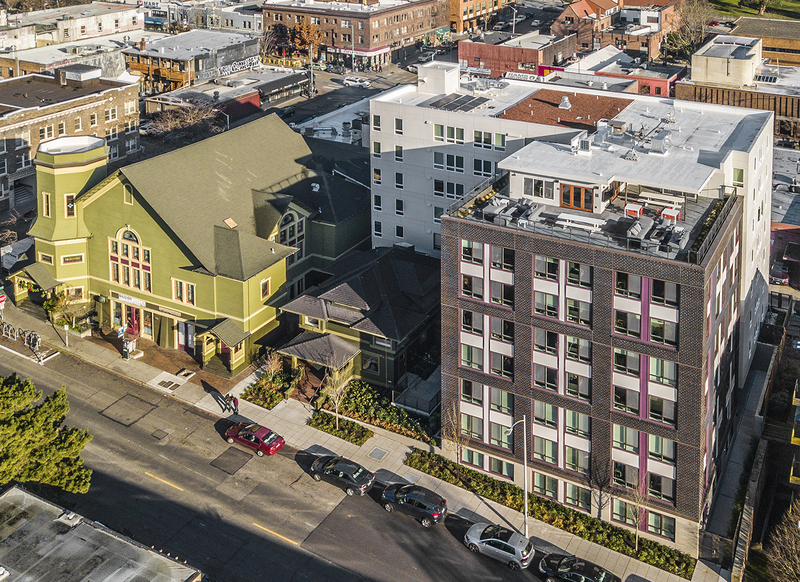 in the University District, and won the Neighborhood Investment Award. Barrientos developed and Schemata Workshop designed the project, which has 84 units. The parsonage — a historic landmark — once served the adjoining church at Northeast 42nd Street and Brooklyn. It now is the main entry to the apartments, and also houses community and amenity spaces for tenants. Nomination information said the development team acquired the property after a previous developer determined it was not feasible to save the parsonage. The team worked closely with the Landmarks Architectural Review Committee, reviewing everything from initial massing to the entry door color. 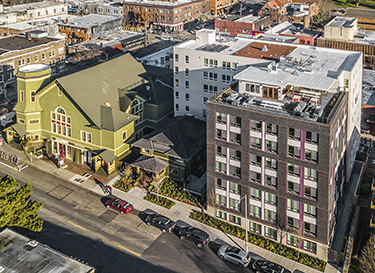 Schaefer Construction renovated the house while Exxel Pacific built the L-shaped apartment building that surrounds it on two sides. Here’s the rest of the team: KPFF Consulting Engineers, civil engineer; Coughlin Porter Lundeen, structural engineer; Rushing Co., sustainability consultant; Jennie Gruss Interior Design; and Karen Kiest Landscape Architects. MarketFront, the mixed-use $74 million addition to Pike Place Market, won the Inspired Expansion Award. The project preserves view corridors and offers new public viewing plazas. Pike Place Market PDA owns MarketFront, which The Miller Hull Partnership designed and Sellen Construction built. The team also included Berger Partnership, landscape architect; Shiels Obletz Johnsen, project manager; Magnusson Klemencic Associates, structural and civil engineer; Arup, MEP engineer; and Beacon Development Group, housing consultant. An awards event, which is sold out, will be held Thursday at Washington Hall.